Valhalla in flames, in an 1894 depiction by Max Brückner, one of the original set designers for the opera. 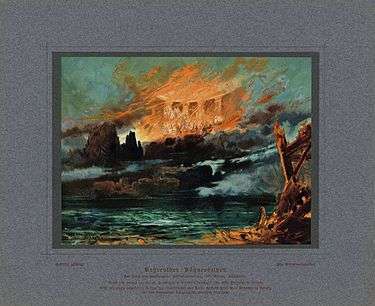 Götterdämmerung ( pronunciation ; Twilight of the Gods), WWV 86D, is the last in Richard Wagner's cycle of four music dramas titled Der Ring des Nibelungen (The Ring of the Nibelung, or The Ring for short). It received its premiere at the Bayreuth Festspielhaus on 17 August 1876, as part of the first complete performance of the Ring. The title is a translation into German of the Old Norse phrase Ragnarök, which in Norse mythology refers to a prophesied war among various beings and gods that ultimately results in the burning, immersion in water, and renewal of the world. However, as with the rest of the Ring, Wagner's account diverges significantly from his Old Norse sources. The three Norns, daughters of Erda, gather beside Brünnhilde's rock, weaving the rope of Destiny. They sing of the past and the present, and of the future when Wotan will set fire to Valhalla to signal the end of the gods. Without warning, their rope breaks. Lamenting the loss of their wisdom, the Norns disappear. As day breaks, Siegfried and Brünnhilde emerge from their cave, high on a mountaintop surrounded by magic fire. Brünnhilde sends Siegfried off to new adventures, urging him to keep their love in mind. As a pledge of fidelity, Siegfried gives her the ring of power that he took from Fafner's hoard. Bearing Brünnhilde's shield and mounting her horse Grane, Siegfried rides away as an orchestral interlude (Siegfried's Journey to the Rhine) starts. The act begins in the Hall of the Gibichungs, a population dwelling by the Rhine. Gunther, lord of the Gibichungs, sits enthroned. His half-brother and chief minister, Hagen, advises him to find a wife for himself and a husband for their sister Gutrune. He suggests Brünnhilde for Gunther's wife, and Siegfried for Gutrune's husband. He reminds Gutrune that he has given her a potion that she can use to make Siegfried forget Brünnhilde and fall in love with Gutrune; under its influence, Siegfried will win Brünnhilde for Gunther. Gunther and Gutrune agree enthusiastically with this plan. Siegfried appears at Gibichung Hall, seeking to meet Gunther. Gunther extends his hospitality to the hero, and Gutrune offers him the love potion. Unaware of the deception, Siegfried toasts Brünnhilde and their love. Drinking the potion, he loses his memory of Brünnhilde and falls in love with Gutrune instead. 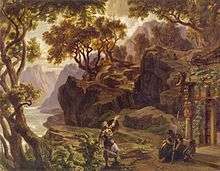 In his drugged state, Siegfried offers to win a wife for Gunther, who tells him about Brünnhilde and the magic fire which only a fearless person can cross. They swear blood-brotherhood (Hagen holds the drinking horn in which they mix their blood, but he does not join in the oath) and leave for Brünnhilde's rock. Hagen, left on guard duty, gloats that his so-called masters are unwittingly bringing the ring to him (Monologue: Hagen's watch). Meanwhile, Brünnhilde is visited by her Valkyrie sister Waltraute, who tells her that Wotan returned from his wanderings with his spear Gungnir shattered. Wotan is dismayed at losing his spear, as it has all the treaties and bargains he has made—everything that gives him power—carved into its shaft. Wotan ordered branches of Yggdrasil, the World tree, to be piled around Valhalla; sent his magic ravens to spy on the world and bring him news; and currently waits in Valhalla for the end. 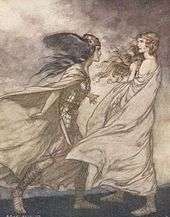 Waltraute begs Brünnhilde to return the ring to the Rhinemaidens, since the ring's curse is now affecting their father, Wotan. However, Brünnhilde refuses to relinquish Siegfried's token of love, and Waltraute rides away in despair. Siegfried arrives, disguised as Gunther by using the Tarnhelm, and claims Brünnhilde as his wife. Though Brünnhilde resists violently, Siegfried overpowers her, snatching the ring from her hand and placing it on his own. Stage design by Josef Hoffmann for original production in 1876 - Act II, last scene. Hagen, waiting by the bank of the Rhine, is visited in his semi-waking sleep (sitting up, eyes open, but motionless) by his father, Alberich. On Alberich's urging, he swears to kill Siegfried and acquire the ring. Alberich exits as dawn breaks. Siegfried arrives via Tarnhelm-magic, having resumed his natural form and left Brünnhilde on the boat with Gunther. Hagen summons the Gibichung vassals to welcome Gunther and his bride. He does this by sounding the war-alarm. The vassals are surprised to learn that the occasion is not battle, but their master's wedding and party. Gunther leads in a downcast Brünnhilde, who is astonished to see Siegfried. Noticing the ring on Siegfried's hand, she realizes she has been betrayed—that the man who conquered her was not Gunther, but Siegfried in disguise. She denounces Siegfried in front of Gunther's vassals and accuses Siegfried of having seduced her himself. Siegfried, who does not remember ever having been Brünhilde's lover, swears on Hagen's spear that her accusations are false. Brünnhilde seizes the tip of the spear and swears that they are true. Once again Hagen supervises silently as others take oaths to his advantage. But this time, since the oath is sworn on a weapon, the understanding is that if the oath is proven false, the weapon's owner should avenge it by killing the perjurer with that weapon. Siegfried then leads Gutrune and the bystanders off to the wedding feast, leaving Brünnhilde, Hagen, and Gunther alone by the shore. Deeply shamed by Brünnhilde's outburst, Gunther agrees to Hagen's suggestion that Siegfried must be killed for Gunther's standing to be regained. Brünnhilde, seeking revenge for Siegfried's manifest treachery, joins the plot and tells Hagen that Siegfried would be vulnerable to a stab in the back. Hagen and Gunther decide to lure Siegfried on a hunting-trip and murder him. They sing a trio in which Brünnhilde and Gunther vow in the name of Wotan, "guardian of oaths", to kill Siegfried, while Hagen repeats his pledge to Alberich: to acquire the ring and rule the world through its power. In the woods by the bank of the Rhine, the Rhinemaidens mourn the lost Rhine gold. Siegfried happens by, separated from the hunting party. 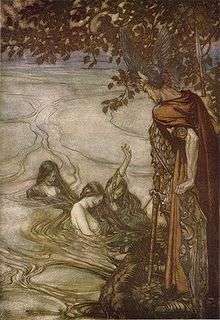 The Rhinemaidens urge him to return the ring and avoid its curse, but he laughs at them and says he prefers to die rather than bargain for his life. They swim away, predicting that Siegfried will die and that his heir, a lady, will treat them more fairly. Siegfried rejoins the hunters, who include Gunther and Hagen. While resting, he tells them about the adventures of his youth. Hagen gives him another potion, which restores his memory, and he tells of discovering the sleeping Brünnhilde and awakening her with a kiss. Hagen stabs him in the back with his spear. The others look on in horror, and Hagen explains in three words ("Meineid rächt' ich!" – "I have avenged perjury!") that since Siegfried admitted loving Brünnhilde, the oath he swore on Hagen's spear was obviously false, therefore it was Hagen's duty to kill him with it. Hagen calmly walks away into the wood. Siegfried recollects his awakening of Brünnhilde and dies. His body is carried away in a solemn funeral procession (Siegfried's funeral march) that forms the interlude as the scene is changed and recapitulates many of the themes associated with Siegfried and the Wälsungs. Back in the Gibichung Hall, Gutrune awaits Siegfried's return. Hagen arrives ahead of the funeral party. Gutrune is devastated when Siegfried's corpse is brought in. Gunther blames Siegfried's death on Hagen, who replies that Siegfried had incurred the penalty of his false oath, and further, claims the ring on Siegfried's finger by right of conquest. When Gunther objects, Hagen appeals to the vassals to support his claim. Gunther draws his sword but Hagen attacks and easily kills him. However, as Hagen moves to take the ring, Siegfried's hand rises threateningly. Hagen recoils in fear. Brünnhilde makes her entrance, after having received the complete information from the Rhinemaidens. Gutrune, initially angry at Brünnhilde, later understands the truth of Hagen's deception and that, in fact, Brünnhilde was the true bride of Siegfried. Brünnhilde issues orders for a huge funeral pyre to be assembled by the river (the start of the Immolation Scene). She takes the ring and tells the Rhinemaidens to claim it from her ashes, once fire has cleansed it of its curse. Lighting the pyre with a firebrand, she sends Wotan's ravens home with "anxiously longed-for tidings", and to fly by the magic fire for Loge to fulfill his task. After an apostrophe to the dead hero, Brünnhilde mounts her horse Grane and rides into the flames. The fire flares up, and the hall of the Gibichungs catches fire and collapses. The Rhine overflows its banks, quenching the fire, and the Rhinemaidens swim in to claim the ring. Hagen tries to stop them but they drag him into the depths and drown him. As they celebrate the return of the ring and its gold to the river, a red glow is seen in the sky. As the Gibichungs watch, deeply moved, the interior of Valhalla is finally seen, with gods and heroes visible as described by Waltraute in Act 1. Flames flare up in the Hall of the Gods, hiding it and them from sight completely. As the gods are consumed in the flames, the curtain falls. Two extended orchestral selections—"Dawn and Siegfried's Rhine Journey", an abridged excerpt from the Prologue without the singers; and "Siegfried's Funeral March", lifted uncut from act 3—are often presented outside the opera house, and are published separately from the lengthy work. Early versions of these selections were approved by the composer himself. These excerpts include specially composed endings so that the excerpt is better able to stand on its own as a complete composition. Siegfried and Brünnhilde's duet (Prologue). This is part of "Dawn and Siegfried's Rhine Journey". Brünnhilde's Immolation Scene (Act 3) as a soprano solo with orchestra (Hagen's single line is omitted). According to Albert Speer, the Berlin Philharmonic's last performance before their evacuation from Berlin at the end of World War II in Europe was of Brünnhilde's Immolation Scene at the end of the opera. Robert A. Hall, Jr. has analysed the opera in terms of cultural symbolism. Hermann Danuser has discussed the dramaturgy of the ending of Götterdämmerung in the context of the entire Ring cycle. William Kinderman has evaluated a large-scale instance of musical recapitulation in Act III of the opera. Warren J. Darcy has expostulated on the potential influence of Wagner's readings of the philosophy of Arthur Schopenhauer on the music of the Ring cycle, particularly on the ending of Götterdämmerung. ↑ The work has sometimes been called in English "Dusk of the Gods" or "Doom of the Gods", but "Twilight of the Gods" correctly translates the German title. Dämmerung can also mean "dawn" as the term is used for both the rising and setting of the sun. Götterdämmerung is itself a translation of ragnarökkr, "Twilight of the Gods", as it is sometimes written in the Prose Edda. In the older Poetic Edda only ragnarök, "Fate of the Gods", is mentioned. It has been proposed that ragnarökkr was either a misconception on Snorri Sturluson's behalf or, more likely, poetic license as a play between the words rök, "fate, doom", and rökkr, "darkness, twilight." ↑ Hall, Robert A., Jr. (May 1963). "The Psychological Motivation of Wagner's Götterdämmerung". The German Quarterly. 36 (3): 245–257. JSTOR 402543. ↑ Danuser, Hermann (Summer 1994). "Musical Manifestations of the End in Wagner and in Post-Wagnerian Weltanschauungsmusik". 19th-Century Music. 18 (1): 64–82. JSTOR 746602. ↑ Kinderman, William (Autumn 1980). "Dramatic Recapitulation in Wagner's Götterdämmerung". 19th-Century Music. 4 (2): 101–112. JSTOR 746708. ↑ Darcy, Warren J. (Spring 1994). "The Metaphysics of Annihilation: Wagner, Schopenhauer, and the Ending of the Ring". Music Theory Spectrum. 16 (1): 1–40. JSTOR 745828. Wikimedia Commons has media related to Götterdämmerung. Richard Wagner – Götterdämmerung. A gallery of historic postcards with motifs from Richard Wagner's operas.